Revealed on March 26, 1916, in ‘Abdu’l-Bahá’s room at the house in Bahjí, addressed to the Bahá’ís of nine Northeastern States of the United States: Maine, Massachusetts, New Hampshire, Rhode Island, Connecticut, Vermont, Pennsylvania, New Jersey and New York. The Northeastern States on the shores of the Atlantic—Maine, New Hampshire, Massachusetts, Rhode Island, Connecticut, Vermont, Pennsylvania, New Jersey and New York—in some of these states believers are found, but in some of the cities of these states up to this date people are not yet illumined with the lights of the Kingdom and are not aware of the heavenly teachings; therefore, whenever it is possible for each one of you, hasten ye to those cities and shine forth like unto the stars with the light of the Most Great Guidance. God says in the glorious Qur’án: “The soil was black and dried. Then we caused the rain to descend upon it and immediately it became green, verdant, and every kind of plant sprouted up luxuriantly.” In other words, He says the earth is black, but when the spring showers descend upon it that black soil is quickened, and variegated flowers are pushed forth. This means the souls of humanity belonging to the world of nature are black like unto the soil. But when the heavenly outpourings descend and the radiant effulgences appear, the hearts are resuscitated, are liberated from the darkness of nature and the flowers of divine mysteries grow and become luxuriant. Consequently man must become the cause of the illumination of the world of humanity and propagate the holy teachings revealed in the sacred books through the divine inspiration. It is stated in the blessed Gospel: Travel ye toward the East and toward the West and enlighten the people with the light of the Most Great Guidance, so that they may take a portion and share of eternal life. Praise be to God, that the Northeastern States are in the utmost capacity. Because the ground is rich, the rain of the divine outpouring is descending. Now you must become heavenly farmers and scatter pure seeds in the prepared soil. The harvest of every other seed is limited, but the bounty and the blessing of the seed of the divine teachings is unlimited. Throughout the coming centuries and cycles many harvests will be gathered. Consider the work of former generations. During the lifetime of Jesus Christ the believing, firm souls were few and numbered, but the heavenly blessings descended so plentifully that in a number of years countless souls entered beneath the shadow of the Gospel. God has said in the Qur’án: “One grain will bring forth seven sheaves, and every sheaf shall contain one hundred grains.” In other words, one grain will become seven hundred; and if God so wills He will double these also. It has often happened that one blessed soul has become the cause of the guidance of a nation. Now we must not consider our ability and capacity, nay, rather, we must fix our gaze upon the favors and bounties of God, in these days, Who has made of the drop a sea, and of the atom a sun. Revealed on March 27, 1916, in the garden adjacent to the Shrine of Bahá’u’lláh, addressed to the Bahá’ís of sixteen Southern States of the United States: Delaware, Maryland, Virginia, West Virginia, North Carolina, South Carolina, Georgia, Florida, Alabama, Mississippi, Tennessee, Kentucky, Louisiana, Arkansas, Oklahoma and Texas. In the Southern States of the United States, the friends are few, that is, in Delaware, Maryland, Virginia, West Virginia, North Carolina, South Carolina, Georgia, Florida, Alabama, Mississippi, Tennessee, Kentucky, Louisiana, Arkansas, Oklahoma and Texas. Consequently you must either go yourselves or send a number of blessed souls to those states, so that they may guide the people to the Kingdom of Heaven. One of the holy Manifestations, addressing a believing soul, has said that, if a person become the cause of the illumination of one soul, it is better than a boundless treasury. “O ‘Alí! If God guide, through thee, one soul, it is better for thee than all the riches!” Again He says, “Direct us to the straight path!” that is, Show us the right road. It is also mentioned in the Gospel: Travel ye to all parts of the world and give ye the glad tidings of the appearance of the Kingdom of God. Therefore, ye friends of God! Appreciate ye the value of this time and be ye engaged in the sowing of the seeds, so that you may find the heavenly blessing and the lordly bestowal. Upon you be Bahá’u’l-Abhá! Revealed on March 29, 1916, outside the house in Bahjí, and addressed to the Bahá’ís of twelve Central States of the United States: Michigan, Wisconsin, Illinois, Indiana, Ohio, Minnesota, Iowa, Missouri, North Dakota, South Dakota, Nebraska and Kansas. Although in the states of Illinois, Wisconsin, Ohio, Michigan and Minnesota—praise be to God—believers are found who are associating with each other in the utmost firmness and steadfastness—day and night they have no other intention save the diffusion of the fragrances of God, they have no other hope except the promotion of the heavenly teachings, like the candles they are burning with the light of the love of God, and like thankful birds are singing songs, spirit-imparting, joy-creating, in the rose garden of the knowledge of God—yet in the states of Indiana, Iowa, Missouri, North Dakota, South Dakota, Nebraska and Kansas few of the believers exist. So far the summons of the Kingdom of God and the proclamation of the oneness of the world of humanity has not been made in these states systematically and enthusiastically. Blessed souls and detached teachers have not traveled through these parts repeatedly; therefore these states are still in a state of heedlessness. 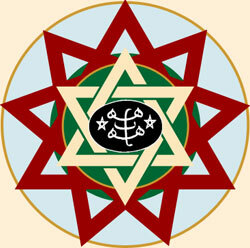 Through the efforts of the friends of God souls must be likewise enkindled in these states, with the fire of the love of God and attracted to the Kingdom of God, so that section may also become illumined and the soul imparting breeze of the rose garden of the Kingdom may perfume the nostrils of the inhabitants. Therefore, if it is possible, send to those parts teachers who are severed from all else save God, sanctified and pure. If these teachers be in the utmost state of attraction, in a short time great results will be forthcoming. The sons and daughters of the kingdom are like unto the real farmers. Through whichever state or country they pass they display self-sacrifice and sow divine seeds. From that seed harvests are produced. On this subject it is revealed in the glorious Gospel: When the pure seeds are scattered in the good ground heavenly blessing and benediction is obtained. I hope that you may become assisted and confirmed, and never lose courage in the promotion of the divine teachings. Day by day may you add to your effort, exertion, and magnanimity. DAY and night I have no other occupation than the remembrance of the friends, praying from the depth of my heart in their behalf, begging for them confirmation from the Kingdom of God and supplicating the direct effect of the breaths of the Holy Spirit. I am hopeful from the favors of His Highness the Lord of Bestowals, that the friends of God during such a time may become the secret cause of the illumination of the hearts of humanity, breathing the breath of life upon the spirits—whose praiseworthy results may become conducive to the glory and exaltation of humankind throughout all eternity. Although in some of the Western States, like California, Oregon, Washington and Colorado, the fragrances of holiness are diffused, numerous souls have taken a share and a portion from the fountain of everlasting life, they have obtained heavenly benediction, have drunk an overflowing cup from the wine of the love of God and have hearkened to the melody of the Supreme Concourse—yet in the states of New Mexico, Wyoming, Montana, Idaho, Utah, Arizona and Nevada, the lamp of the love of God is not ignited in a befitting and behooving manner, and the call of the Kingdom of God has not been raised. Now, if it is possible, show ye an effort in this direction. Either travel yourselves, personally, throughout those states or choose others and send them, so that they may teach the souls. For the present those states are like unto dead bodies: they must breathe into them the breath of life and bestow upon them a heavenly spirit. Like unto the stars they must shine in that horizon and thus the rays of the Sun of Reality may also illumine those states. God says in the great Qur’án: “Verily God is the helper of those who have believed. He will lead them from darkness into light.”This means: God loves the believers, consequently He will deliver them from darkness and bring them into the world of light. It is also recorded in the blessed Gospel: Travel ye throughout the world and call ye the people to the Kingdom of God. Now this is the time that you may arise and perform this most great service and become the cause of the guidance of innumerable souls. Thus through this superhuman service the rays of peace and conciliation may illumine and enlighten all the regions and the world of humanity may find peace and composure. During my stay in America I cried out in every meeting and summoned the people to the propagation of the ideals of universal peace. I said plainly that the continent of Europe had become like unto an arsenal and its conflagration was dependent upon one spark, and that in the coming years, or within two years, all that which is recorded in the Revelation of John and the Book of Daniel would become fulfilled and come to pass. This matter, in all probability, was published in the San Francisco Bulletin, October 12, 1912. You may refer to it, so that the truth may become clear and manifest; thus ye may fully realize that this is the time for the diffusion of the fragrances. The magnanimity of man must be heavenly or, in other words, it must be assisted by the divine confirmation, so that he may become the cause of the illumination of the world of humanity.